“Giving is better than receiving because giving starts the receiving process"
You don’t take compliments very well. In fact, they make you uncomfortable. You tend to refuse any kind of help, not wanting to bother people or take their time or money. You are independent. You never ask for help. You have a hard time asking for the things you want. You have to work hard for things before you deserve them. Unexpected gifts make you uncomfortable. You are a polite person. You always say: “NO, Thank you”. Life seems to be hard and it’s only getting worse. You could call yourself unlucky. You keep attracting aloof or indifferent love partners or ones that aren't completely available. While love can be challenging most day's sometimes we can focus too much on what the problems are versus going to a deeper level of what is causing the problem or challenge. If you have had repeat patterns or keep falling for the same type of person that ends with the same result perhaps it is time to look at how comfortable you are at giving love and/or receiving love and what you are attracting to yourself in love and why. There is a wise adage that says: You can't give something you don’t have”. In order for us to be able to give love we have to love ourselves first. In order to be worthy of receiving love we have to love ourselves first. Our expectations of what we feel worthy of attracts to us events, circumstances and situations in all areas of our lives. To love and be loved is probably the great accomplishment in our lives. We all want to be loved and spend many hours, weeks and months wondering about how we are going to get it! Once you break the cycle of giving love but blocking receiving love the love flows like the most beautiful babbling creek that you have ever seen. If you are overgiving in your love relationships begin by cutting back from always being the ones that gives it his or her all. Allow your partner to do some of the giving by creating opportunities for him/her to give to you. You want to break the cycle of the giver/taker syndrome which is a breeding ground for resentment and creates feelings and emotions of being a victim and a martyr. Once you learn to receive love as easily as you give love you will complete the cycle of love. By allowing others to love you through words or actions many of your fears or uncomfortable feelings will subside about love. In time you will probably notice that your self worth has increased and it will as you are open to receiving love. Love is a two way street. It is created and stays fertilized with an equal amount of giving love and receiving love. Also, remember that when you allow someone to love you, through their actions or deeds you are allowing the other person to feel good about themselves. Who doesn't want to be around a person that makes you feel good about yourself! Make a list or write small paragraphs of how you would like to be loved. What does the person need to do or act towards you that would make you happy. Then look at this list and see if you would actually be comfortable in having these actions and deeds bestowed upon you. If you have attracted someone who is not comfortable receiving love they may not be comfortable as well in giving you the love that you feel you would like to receive. Begin noticing today if you are over-giving and if your partner is under-giving. Both of you can practice the flow of new love which has both elements - giving AND receiving. How does this play out in your love life? You may attract partners that have difficulty "giving" love. They may be distant, indifferent or aloof when it comes to love matters. You also could have developed a pattern of staying too long in unhappy and unfilling love relationships. Love is a gift that we give to ourselves and to others. How could something so beautiful sometimes cause so much heartbreak. If you find yourself uncomfortable with receiving love try gifting yourself - take little breaks during your week and give love to yourself - either through a massage, buying yourself flowers or anything that brings you pleasure. Reach out to family, friends, strangers who may need an encouraging word. It is when we give that we receive and assisting humanity and doing those spontaneous random acts of kinds make us feel good about ourselves. Another common trait of a person who may be uncomfortable in receiving love is to set up relationships that can be kept at an arm's length - in other words, long distance relationships, dating people that are not available. Those relationships enter a safe zone and make the person who may be uncomfortable with receiving love comfortable or keep them in their comfort zone regarding love. To those that are involved with love partners who have difficulty expressing themselves express yourself and give them ample opportunities to express themselves by asking them questions. Be careful of the "feelings" word as sometimes people who are closed off from love for a myriad of reasons can be uncomfortable expressing their feelings. Work around that word by merely saying - how do you feel about that or how do you feel about this, but don't over do it. Also, spend time in researching, yes you heard me say "researching" how your partner likes to be loved. We all have different ways that we prefer to be loved. 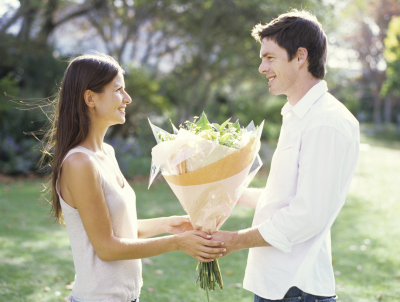 Does your partner like outward demonstrations of love - such as, flowers, little spontaneous gifts or does your partner like a text message that merely says - thinking of you today. Try to balance your relationship so no one person is the giver and/or taker. If you have challenges with receiving love or feel uncomfortable with demonstrative actions or overtures of love share this with your partner. Love, real love has an honesty to it and a transparency to it.